Learn more about our one-month Free Trial offer. Read with your child in Spanish. ¡Es fácil! Refer a Friend, Receive a FREE Month of Membership! With our Referral Program there is no limit to the free service you can build up. 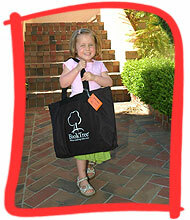 The benefits of a BookTree Gift Certificate stay with a child for life. And let your friends know you LIKE us! Reading aloud with your child stimulates brain development and establishes the foundations for reading, writing, and success in school. These profound benefits stay with your child for life. How do you ensure a steady supply of extraordinary books that you and your child will love to read together? BookTree’s monthly lending program addresses this challenge for busy parents. BookTree combs through the half-million children’s books in print and about 10,000 new books published each year, painstakingly reviewing and analyzing to find the best books for BookTree members to read with their children. Books are available in both English and Spanish. Each month, your child receives a personalized tote containing ten carefully-selected, illustrated, age-appropriate literary gems, spanning a broad range of content, themes, vocabulary, and illustrative styles. Your child’s tote is conveniently delivered to a place you frequent regularly: a participating school, workplace, or neighborhood location. With over ten years of enthusiastic support from educators and school directors, BookTree is currently available in San Francisco, the peninsula from Sunnyvale north, Marin County, and western Los Angeles County. What are parents who have participated for years saying about the difference BookTree has made for their children? Read their testimonials. The first month is FREE with no obligation, so try it out and sample BookTree membership’s lifelong benefits for your child! If you continue after the first free month, the monthly membership is $25.95, month-to-month, no contract, stop and restart as you wish. What are the Benefits of BookTree? ©2019 BookTree®, LLC. All rights reserved. Policy & Terms.